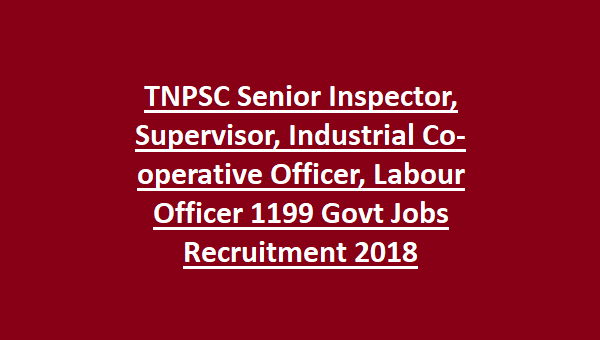 TNPSC Senior Inspector, Supervisor, Industrial Co-operative Officer, Labour Officer Recruitment 2018:Tamil Nadu Public Service Commission released an official notification for Combined Civil Services Examination for recruitment to various Jobs namely Senior Inspector, Supervisor, Industrial Co-operative Officer, Labour Officer and Others. Candidates applying to any of the above posts must not exceed the upper age of 30 Years and must not be below 18 years as reckoned on 01-08-2018. Note: No Maximum Age limit has been imposed to candidates belonging to reserved category candidates. Candidates contending for any of the above Post must be a Graduate in the concerned discipline from an Institution recognized by University Grants Commission/Madurai Kamarajar University/Bharathiyar University/Annamalai University. Applicants who have successfully registered for any of the above Post within the stipulated date will be assessed on the basis of Written Test based on syllabus as per the educational standards required for the post followed by Oral Test & Interview. Written Examination will be conducted in two stages – Preliminary Examination & Mains Examination. Preliminary Examination will be qualifying in nature and only those will appear in the Mains who qualify the Prelims. Mains Exam will consist of Descriptive type Questions based on the syllabus as per the educational standards to be completed in 3 hours. Minimum qualifying marks for all categories is 120 Marks. Candidates belonging to General Candidates are liable to pay the Examination fee as well while the reserved category candidates are exempted from the same. Candidates interested can apply online through the official website http://www.tnpsc.gov.in/ before the due date i.e. 9th September 2018. 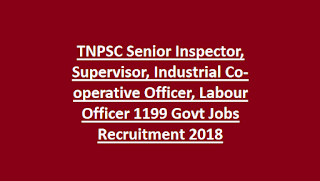 Candidates seeking possession under TNPSC Senior Inspector, Supervisor, Industrial Co-operative Officer, Labour Officer Jobs Recruitment 2018 can refer the official notification.